Boston Mayor Marty Walsh has introduced a new food grading system that may soon affect every restaurant in the city of Boston. All Boston restaurants and food trucks will be handed a letter grade of A, B or C if the mayor’s proposal goes through. Boston is packed full of nearly 3,200 restaurants and food trucks. Under the proposal, each one will be required to post its city-issued letter grade. It will fall on 18 inspectors to investigate all of the city's restaurants and food trucks. Similar food safety ratings are already in place in New York, Los Angeles, and most recently in Newton, Massachusetts. If the restaurant doesn't post its rating immediately, it will be fined $300 per day. necn Investigates looked at the top violations for 2016 so far this year. Just this year, of the thousands of violations we found, nearly 2,000 had to do with food protection. Nearly 800 times, inspectors found insects, rodents and animals. And there were thousands of violations for not storing food at the proper temperatures. The violations are especially concerning when you consider the Centers for Disease Control estimates one in six Americans get sick from food. Restaurants and food trucks with a low grade, below an A, will have 30 days to clean it up and be re-inspected. If approved, the A, B, C letter grades will go online in the next month. 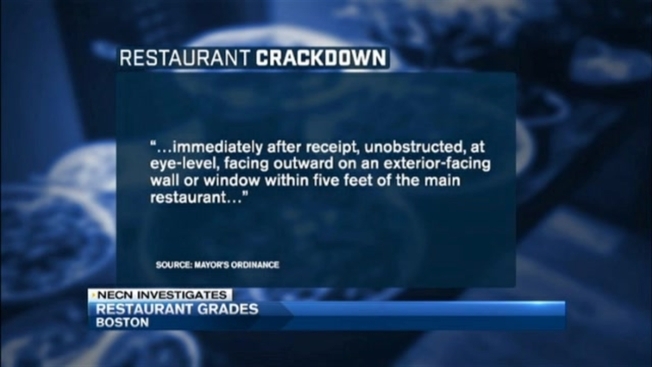 Actual posting of the grades in restaurant windows will start a year later.